Dealing with security guards wasn’t exactly what we had in mind when we decided to go on an ice cream run. It was a mild March day in Havana, by Cuban standards. Yet, having just flown in from New York days prior, we hoped a scoop could ease the transition from the blustery weather back home. We were eight NYU students part of a larger group taking a field intensive course in Cuba, and after a lecture, we had decided to head to La Coppelia. It is one of the world’s largest ice creams parlors and occupies an entire city block in the Vedado district of Havana. The central structure looks like something out of the Jetsons, but the area surrounding it is more like a park with tables and awnings where Cubans can enjoy their ice cream. As we approached, a guard stopped us in our tracks. “Yes,” I replied in Spanish. “Will you be paying in Cuban Convertible Pesos (CUCs) or pesos?” he continued. We followed him to a set of stairs. Another guard noticed us and gestured for us to follow him to the second floor. We were taken to a private room with a handful of people inside. We sat down and ordered. Something was off. We had bypassed a line outside that snaked around the block. More entrepreneurial types even hawked cones and various ice cream-accouterments in line as customers patiently waited, but we received special treatment. Come to find out, this event was a microcosm of a pressing reality in Cuba—the plight of two currencies. The issue has already fractured Cuban society, but as the country makes preparations to integrate further into the global market economy, the situation is an indication of the island’s fragility. The two-currency system was created in 1994 as a way to deal with a weak economy. 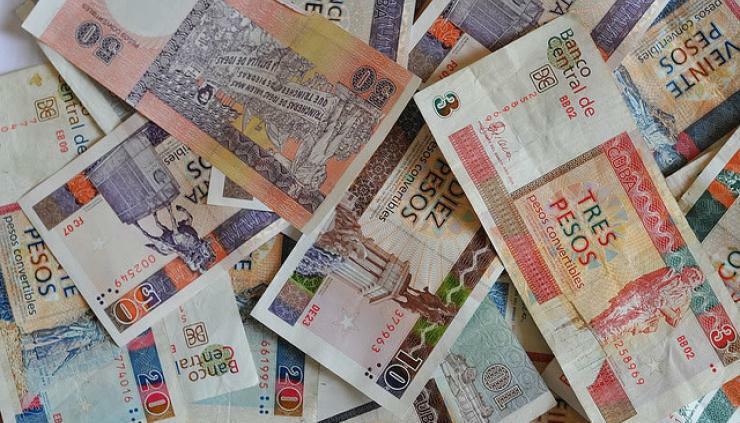 The Convertible Cuban Peso emerged as a second currency, and was pegged to the U.S. dollar. The Cuban government originally implemented CUCs to be used in the tourist industry and for luxury goods, but over time, this has created issues of access. What makes the situation more complex, is that there are two valuations of the peso in this system. At official exchange offices, or CADECAs, the rate is approximately 25 pesos per CUC. However, for state purposes the peso to CUC exchange is seen as one to one. Though, not all Cubans even have access to CUCs. La Coppelia is one of the few cases where the dichotomy is so blatant. But consider a doctor who makes $64 USD per month. Paid out in Cuban pesos, this equates to $1,675 pesos per month. However, the real value of this salary depends on where it is used. If it is falsely inflated by the state, like it is at La Coppelia, the doctor’s monthly salary will be equivalent to $1,675 CUCs. At a CADECA, however, the doctor could only exchange that monthly salary for $67 CUCs. Doctors used to be some of the highest paid professionals in Cuba. But now, lesser skilled entrepreneurs that are paid in CUCs have been able to exploit the two-currency system. Taxi drivers, hotel staff, and restaurant owners are perfect examples. For instance, if a typical taxi driver charges 8 CUC to take someone from the Vedado district of Havana to Old Havana, he or she only needs to complete this trip nine times per month to make more than a doctor. The trip takes less than 15 minutes. The dual currency system has fractured the Cuban society. It can only be dealt with by uniting the two currencies—which the Cuban government announced it would do back in 2013. But even then there is potential for crisis. If the Cuban government were to announce overnight that one currency was no longer relevant, inflation would skyrocket—precipitating a serious economic crisis. Not to mention this would discourage foreign investment, which the island is so desperate for. Unfortunately, there is no easy solution, these are some of the growing pains that Cuba must endure in order to successfully transition to a full-fledged member of the global economy. Cuba cannot continue to have its ice cream and eat it too. Dylan Heyden is a M.A. Candidate of International Relations at New York University Graduate School of Arts and Sciences.